Celebrate season’s greetings with this Friday cocktail, the Poinsettia. I’ve seen the Poinsettia pop up on lists of “traditional” holiday cocktails, but there’s not much evidence of it dating back prior to the 1990s, at the earliest. It likely came into vogue around the same time as the Cosmopolitan, which also makes use of cranberry juice. You’ll get a lot more cranberry flavor here, but that may depend on how much champagne you add. Some recipes substitute Prosecco or even a Moscato for the champagne, but it’s best to stick with the drink as originally designed. At least for your first try. Chill your champagne and cranberry juice beforehand. 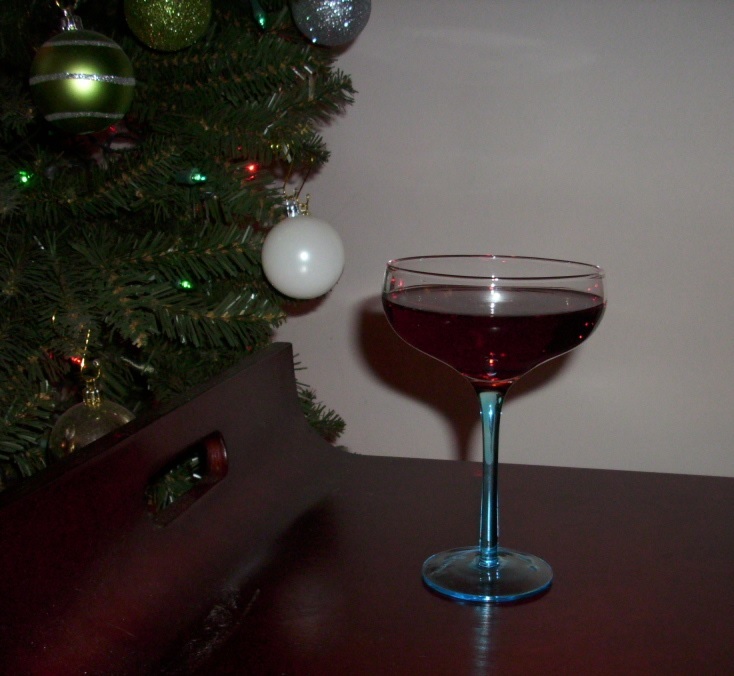 In a champagne flute, pour in 1 ounce of cointreau (or triple sec) and 2 ounces of cranberry juice. Fill the glass with champagne and serve. How I like it: With a 5 or 6 ounce champagne flute, the above proportions work well for a balanced cocktail. If you live in Central New York, you may want to consider an updated alternative of sorts. Cayuga Ridge Estate Winery, located in Ovid, NY, produces a Cranberry Frost sparkling wine which can serve as a fine alternative to both the champagne and cranberry juice. Pour an ounce and a half of cointreau (or triple sec) in your glass and fill with the Cranberry Frost. It makes for a delicious twist on the holiday Poinsettia cocktail worth trying. Survive the Holidays, drink responsibly! VERY appropriate for the holiday. Was the picture taken at your house? Is that your Christmas tree? Did you try it with the Cranberry Frost sparkling wine? If you did, was it as good? At this late date, IF it was just as good with the Cranberry Frost – do you know if it’s at Liquor City? Yes, it’s the tree at my place. You can also see it in this post from a previous year. The Cranberry Frost is quite good, but overpowering. I had to up the portion of Triple Sec I used. As for it’s availability, I’m not sure. I had picked up the bottle at the winery last summer.